Because RPA software interfaces with existing applications and systems, it can be rolled out rapidly, with minimal business disruption. At the same time, bots are typically applied to existing processes, so productivity gains can be realised in a short timeframe (sometimes only weeks). When implemented effectively, this technology can increase productivity levels quickly. Once bots are up and running, they can work around the clock as they do not need sick days or annual leave. By delegating labour-intensive processes to RPA, companies can cut costs such as salaries, overheads and so forth, while adding more flexibility into the labour pool (because RPA resources are highly scalable). Because RPA software interfaces with existing applications and systems, it can be rolled out rapidly, with minimal business disruption. At the same time, bots are typically applied to existing processes, so productivity gains can be realised in a short timeframe (sometimes only weeks). Unlike outsourcing or offshoring, RPA keeps the work in-house. This means companies can manage the ‘workforce’ more closely; while those in regulated industries are also able to comply with data privacy and residency regulations, prove governance standards and so forth. Research firm Forrester has pointed out that ROI is easy to prove because the cost of a bot ranges from USD 5,000 to USD 10,000 annually; and this can be directly compared to the expenses associated with workers who are replaced or re-assigned due to the technology. RPA technology is designed to carry out the type of routine tasks that people are usually responsible for. Because this work is digitised and automated, the risk of human error and its potential costly consequences are reduced. At the same time, tasks are processed the same way every time, which enhances consistency and the quality of output. With everything handled digitally, the firm has access to metadata that provides process oversight and supports regulatory compliance. When the software logs every action, it’s easy to monitor progress and prove the who, what and how of processes – should this information be required by internal or external auditors. Many industries are data-driven. Their processes rely on large volumes of documents and data, as well as multiple legacy systems that store and manage this information. 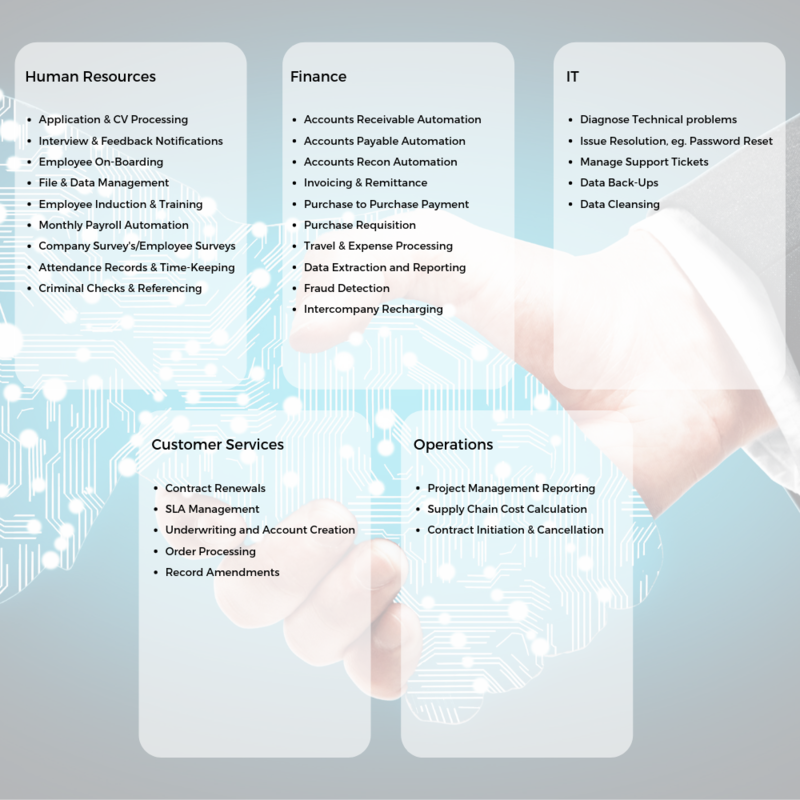 RPA can reach across these systems to retrieve and collate data for reports, customer on-boarding processes and other process outputs. With the ability to work 24/7 and scale quickly to meet demand, RPA allows companies to increase output and expand operations or react rapidly to new business opportunities. Whether organisations want to increase the lifetime value of customers or explore new income opportunities, bots provide the efficiency and agility required to support these business goals. 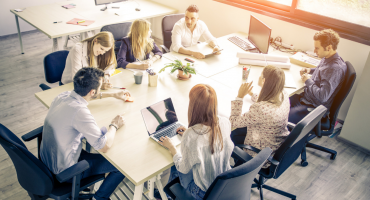 By implementing RPA software across certain business processes you can liberate staff from monotonous tasks and re-distribute resource, perhaps in more strategic areas. A secondary effect of re-allocating resource is the positive impact it may have on the employee that would normally carry out the business process. Through implementing the ‘bots’ to follow rules-based tasks the employee may then be better utilised with the potential for greater job satisfaction. 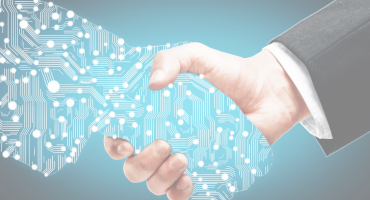 RPA solutions can be delivered at a pace and re-used/reapplied to be compatible with ongoing developments, further supporting ROI in the longer-term. 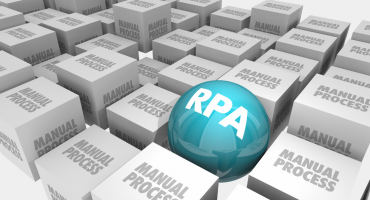 We have many live examples of every-day business processes that demonstrate the tangible benefits of implementing RPA. Alternatively, If you have already identified a business-specific use case that you are looking to improve with RPA, then we’d be happy to personalise your demo to your exact requirements.